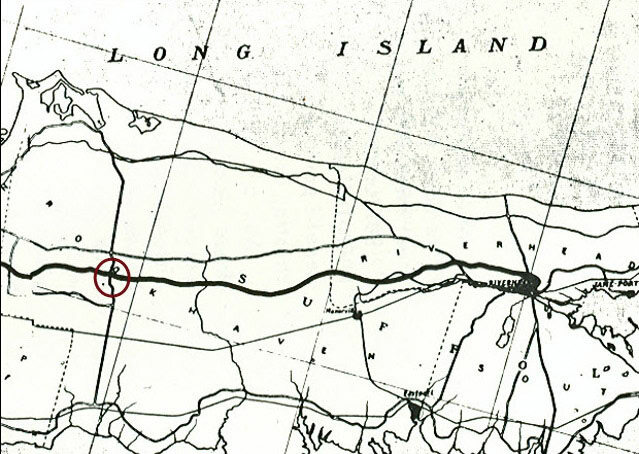 Following a spectator death during the 1906 Vanderbilt Cup Race, a privately owned 60-mile speedway to connect Queens and Riverhead was proposed by William K. Vanderbilt, Jr. and his business associates . 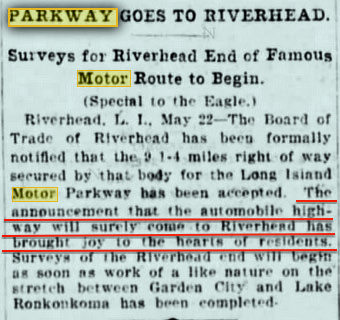 With the assistance of Art Kleiner, here are details on the section of the Motor Parkway from Lake Ronkonkoma to Riverhead that was planned but never built. Update: December 4, 2016: Art Kleiner has added articles and a map (1907-1911). 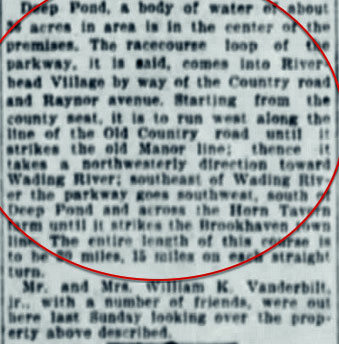 As published in the October 25, 1906 issue of The Automobile, the plan "provides for a straightaway road of 65 or more miles that will extend from Floral Park through the center of Long Island to Riverhead. Note: The proposed loops in the Hempstead Plains (Hicksville) and Riverhead. The front page of the October 21, 1906 issue of The New York Times headlined a "60-Mile Road to Cost $2,000,000...No More Racing Dangers. Speedway to be for All Who Pay Toll." 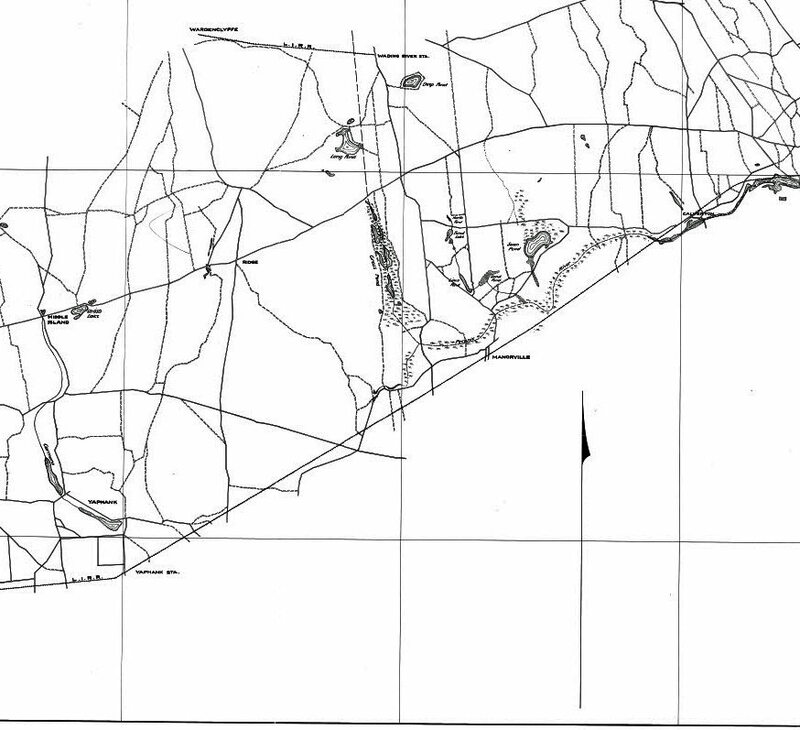 This 1907 four-foot map showed the property from Lake Ronkonkoma to Riverhead in which the 32-mile additional route would be planned. 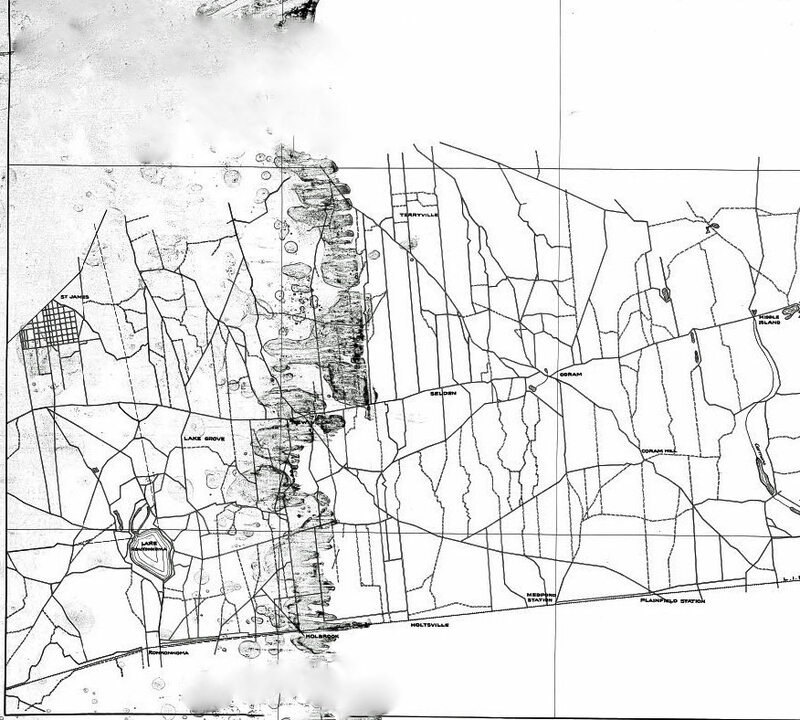 This early map did not indicate the planned route for the Motor Parkway. Lake Ronkonkoma to Middle Island. 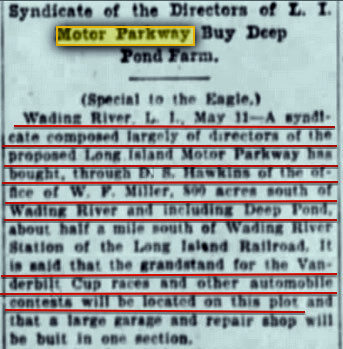 A survey of the planned "Automobile Parkway" just west of Riverhead. 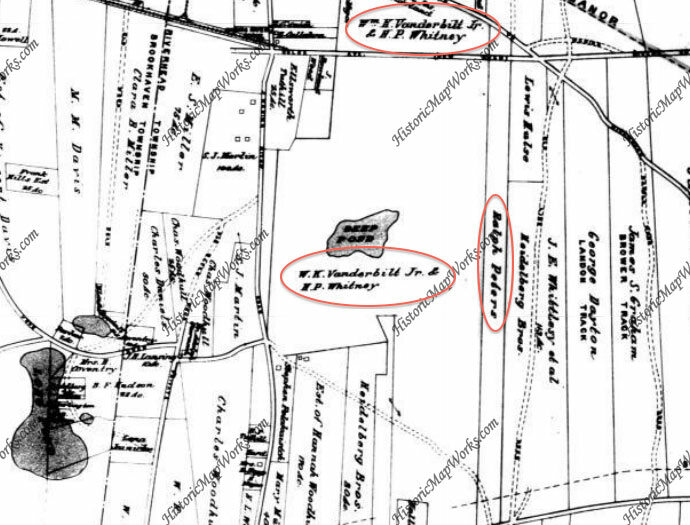 Two of over 35 Brookhaven/Riverhead surveys in my collection of properties purchased by the Motor Parkway for this section. 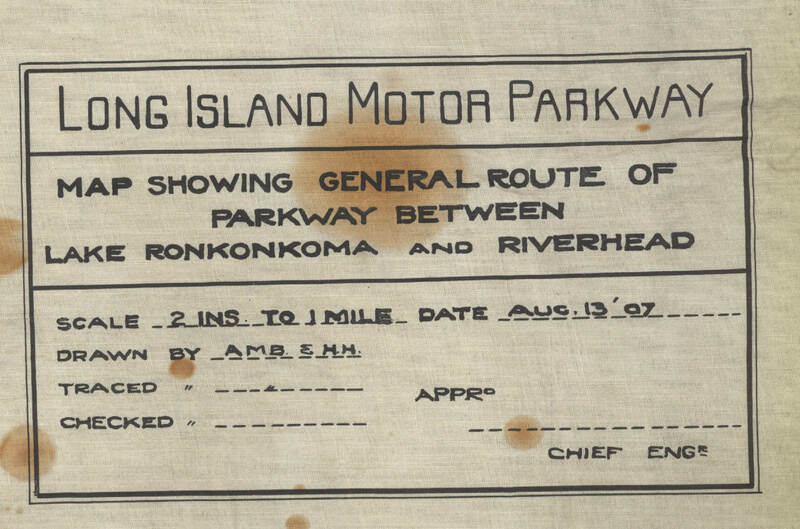 One of the few known maps showing the planned Motor Parkway route to Riverhead. The proposed route of the Motor Parkway from Floral Park to Lake Ronkonkoma. Note the outline for the 1908 Vanderbilt Cup Race course. The proposed route of the 32-mile section from Lake Ronkonkoma to Riverhead. 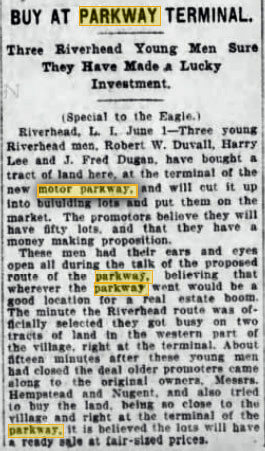 The land was acquired and later sold when the Motor Parkway here was not built. 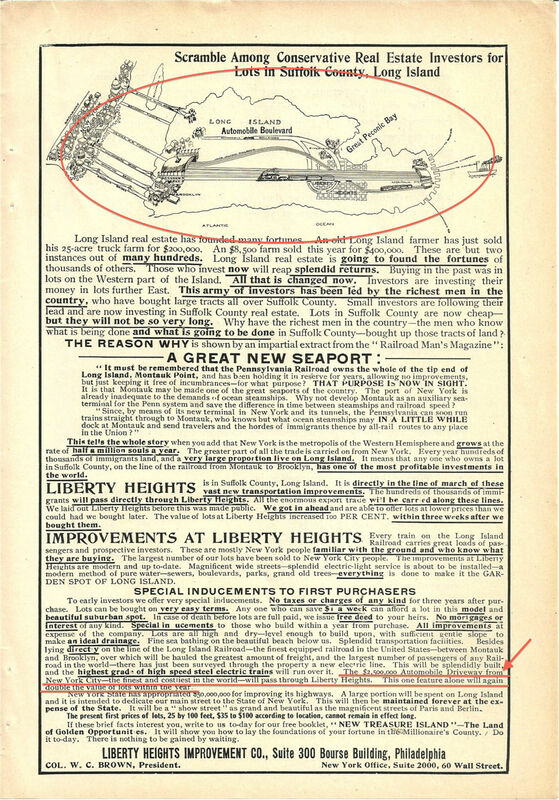 Art Kleiner has discovered this ad for a Riverhead property owned by Liberty Heights Improvement Company. it was printed in the Trow 1908 Copartnership and Corporation Directory. 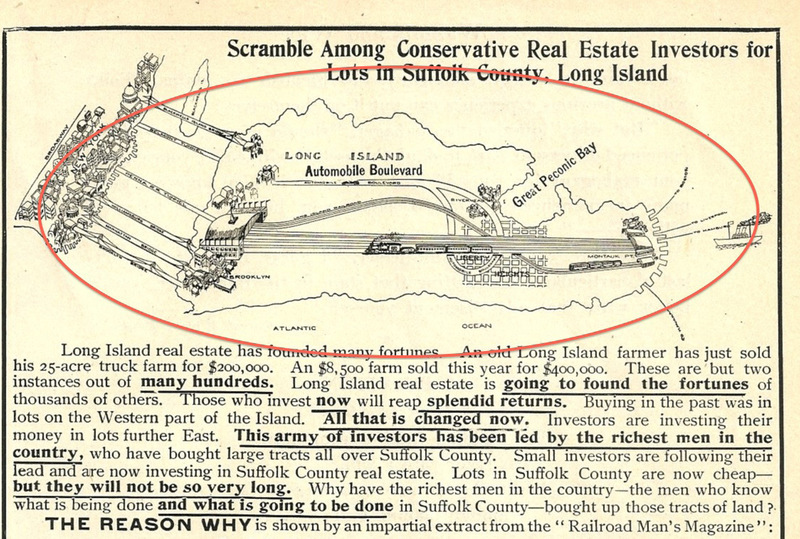 The ad featured this cartoon map of the route of the LIRR route from Brooklyn to Montauk and the proposed "Automobile Boulevard" (Long Island Motor Parkway) from Queens to Riverhead. 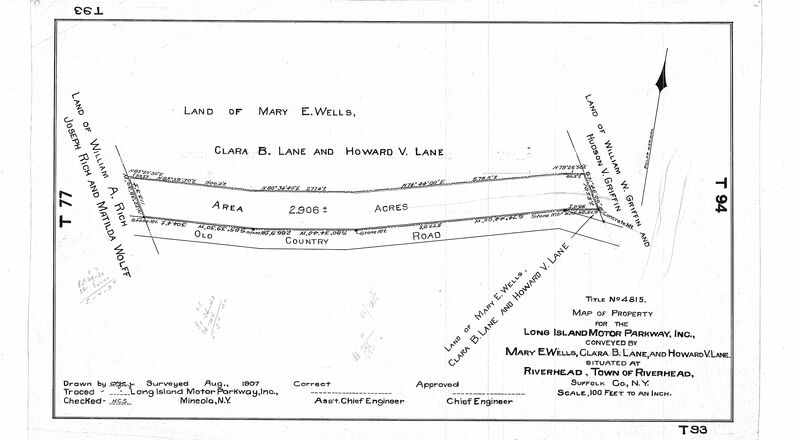 Note: The proposed loop in Riverhead corresponds with the above October 1906 plan. 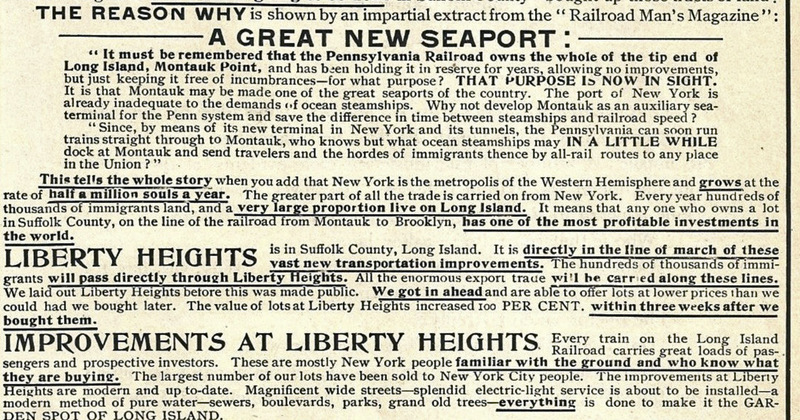 The ad promoted the value of the Motor Parkway passing "Liberty Heights". "The $2,500,000 Automobile Driveway from New York City- the finest and costliest in the World- will pass through Liberty Heights. This one feature alone will double the value of lots within the year." A.R. Pardington makes a presentation in Riverhead describing the future Motor Parkway plans in Suffolk County. 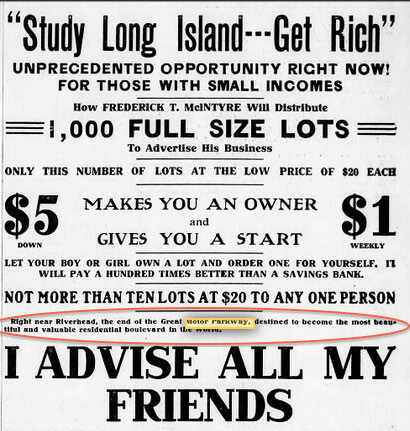 Ad promoting the benefit of purchasing 73 acres in Riverhead adjoining the Motor Parkway. 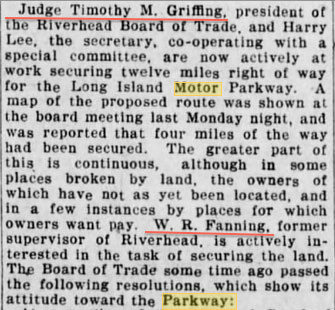 Riverhead Board of Trade actively working to secure 12 miles for the Motor Parkway right-of-way. "We recognize that the Long Island Motor Parkway is an enterprise big with possibilities of development and advantage to Riverhead..."
Riverhead property owners consent to give 2-3 miles of the right-of-way for "the big automobile parkway." 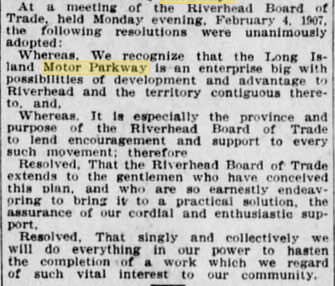 Motor Parkway bridges were planned for seven Riverhead roads. A.R. Pardington indicated the Vanderbilt Cup Race grandstands could be relocated to Riverhead. 800 acres purchased by a syndicate of Motor Parkway directors around Deep Pond. "It is said that the grandstand for the Vanderbilt Cup races and other automobile contests will be located on this plot." 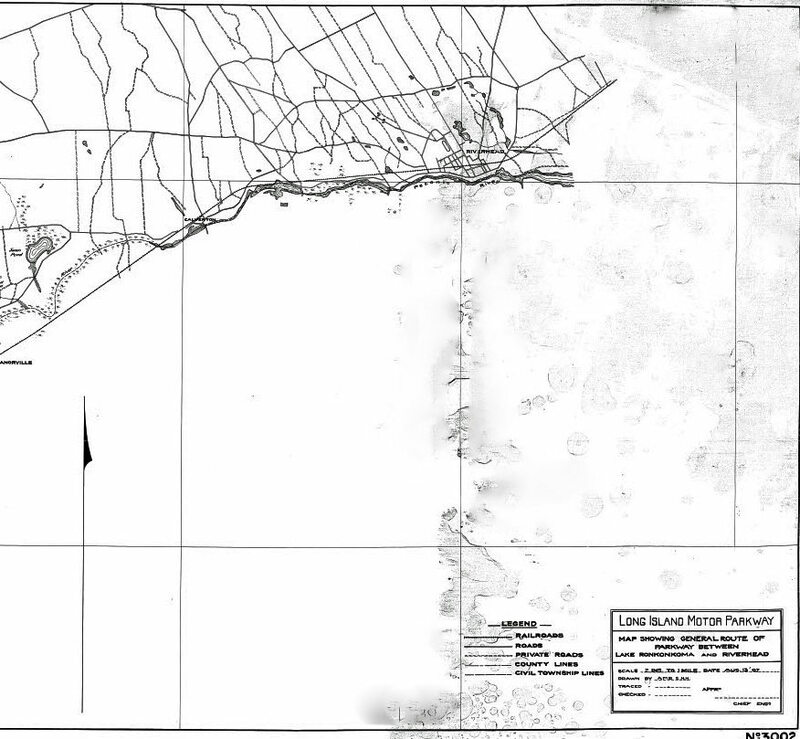 1909 Belcher Hyde map showing the property purchased by William K. Vanderbilt, Jr. and H.P. Whitney. 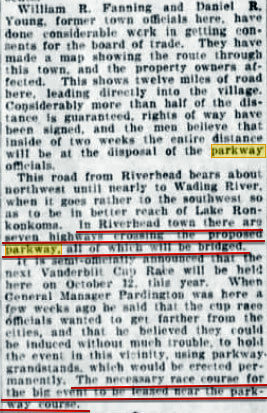 The racecourse loop of the parkway comes into Riverhead Village by way of the Country Road and Raynor Avenue. 9 1/3 miles of the right-of-way in Riverhead were secured. 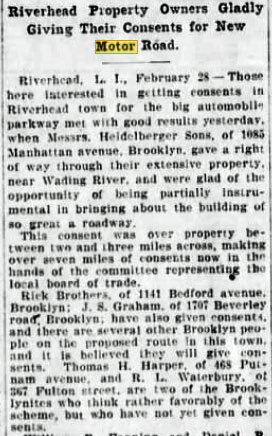 "The announcement that the automobile highway will surely come to Riverhead has brought joy to the hearts of residents." Tract of land purchased at the terminal of the new motor parkway in Riverhead. 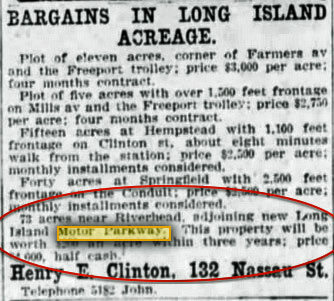 Real estate ad promoting "Right near Riverhead, the end of the Great Motor Parkway, destined to become the most beautiful and valuable boulevard in the World." Motor Parkway surveyors begin work in Riverhead. 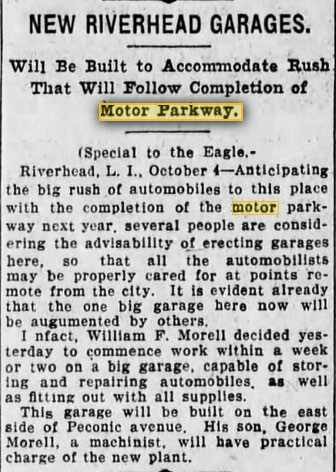 Plans to build garages in anticipation of the Motor Parkway. Right-of-way for the Motor Parkway was complete from Wading River to Riverhead. 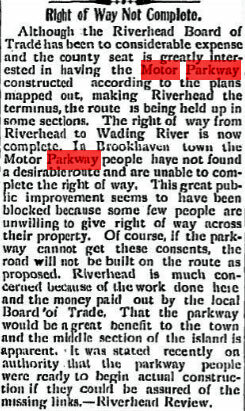 However, the route was still not completed in Brookhaven. 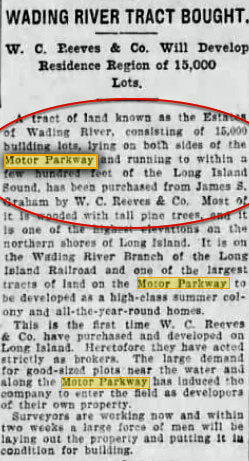 W.C. Reeves purchased 15,000 lots in Wading River on both sides of the Motor Parkway. "The large demand for good-sized plots near the water and along the Motor Parkway has induced the company to enter the field as developers of their own property." The Long Island Motor Parkway sold 3,804 acres to MMH Dayton.